The Numina Task Force is the last of six Freedom Phalanx Task Forces, and the completion of all six grants the Task Force Commander Badge. The other five task forces are started by Positron, Synapse, Sister Psyche, Citadel, and Manticore. Towards the end of the task force, the team will be required to visit most of the zones of Paragon City to hunt after a wide range of enemy factions. It may be helpful to plan ahead for your team to split up to reduce travel time, since many of the hunts are for enemies that will con grey and can easily be handled by one or two heroes. This task force is also designated as a Signature Task Force. As such, missions will always spawn mobs at level 40 or higher, regardless of team members' levels. 2.5 Scan Paragon City using the Shard of Kalak. Combat opponents to power the artifact. Merit Rewards: This activity awards 36 Reward Merits. It is well that you are here. I have sensed a disturbance in the mystical fabric of this city. I cannot tell what is causing it, but my protege, Infernal, senses something unusual in a nearby cave network. Go to the caves and tell me what you find. The winds of fate are blowing, Task Force. Change is in the air. I believe the code name Task Force Name suits you very well. You could sense from Numina's tone that locating the cause of the disturbance quickly is the primary goal of this mission. You located the source of the mystical disturbance. It is well that you freed Fatespinner, but I am still sensing the disturbance. It seems that whatever is causing this has something to do with one of Paragon City's defenders. I must admit, you are a fine group of heroes. I have sensed a confluence of heroes and negative energy. It is somewhere in the Folly of Crey. I suppose it is not surprising that something like this would be connected to those defilers. You must determine what lies at the center of this disturbance. This Facility looks state of the art in terms of technology and security. You discovered the purpose of the Crey facility. These partially corrupted files indicate that Crey has a division that actively seeks out and captures heroes. The files you have focus on a particular target that has been eluding them for some time. This hero has been designated with the code name Generation Zero. This is most troubling. We must determine more about this unknown hero. I will call to Manticore, for suggestions on where to seek him. You only have to click the glowie at the end to complete the mission. Manticore has suggested that we look into the disappearance of a Hero called Scout, who operated in Paragon City, in the early part of the twentieth century. He believes that Nemesis may have more information and has suggested a place to investigate. It was a long time ago that Scout vanished, I cannot see the connection, but I have learned to trust Manticore on such matters. Follow the lead that Manticore has provided. Although his name has not been spoken often of late, Scout was one of the first heroes Paragon City ever knew. You have uncovered the fate of Scout. Such cruelty! That poor man has been trapped in that living prison for a lifetime. His passing is a blessing upon him. His dying words ring true in my ears, it is the Woodsman we seek. We must find him, but I cannot seem to pinpoint his location. Task Force, you are truly a boon to Paragon City. This may seem at first glance like a rescue mission, but it's actually a boss-killing mission. Scout must be defeated for the mission to be completed; he is usually inside a war hulk, but can sometimes be found inside a Fake Nemesis. We must find a way to pinpoint the location of the Woodsman. Go and speak with Azuria at MAGI. I believe she knows of an object that will help us in this quest. I am sorry that my senses are being confounded, and I fervently hope that Azuria may aid us. Please, accept the aid that MAGI is offering. There is a mystical object known as the Shard of Kalak. It can be attuned to locate and contain the essence of a specific individual by a powerful mystic, such as Numina. We believe it is currently being held by the Circle of Thorns. Go to the location I will indicate, retrieve the Shard, and then return it to Numina. You must bring the Shard of Kalak back to me, so that I can attune it to locate Woodsman. Smoke and sulfur interweave to form a pungent odor. You retrieved the Shard of Kalak! In order to obtain the Shard of Kalak you must defeat the Envoy of Shadows and all of the enemies in the last room of the map. The Shard of Kalak is not a Glowie: it is received by defeating every enemy in that room. The Envoy of Shadows appears dressed as a Death Mage, not a large Behemoth, and is only a Boss rather than an Arch-Villain. This powerful mystic device is powered by a mystic resonance. Once attuned, it can be used as a location device. How the shard is used determines its level of effectiveness. The more resonance that is built up within it, the more chance it will perform the desired task. Thank you. I will attune the Shard so that you may use it to search for Woodsman. It should not take long. Scan Paragon City using the Shard of Kalak. Combat opponents to power the artifact. The Shard of Kalak is ready. You will need to make your way around the city in a specific pattern in order for it to be used appropriately. Start in Perez Park and then work you way around the city, first widdershins and then deosil. Moving in this counterclockwise and then sunwise pattern will build power within the Shard. The Shard will take a few moments to scan, and legend has it that conflict is required to power it. The more enemies of Paragon City you can defeat while carrying it, the more likely it is to work. I cannot rest until you locate the source of this disturbance. You defeated 10 Circle of Thorns cultists in Perez Park. Proceed to Atlas Park. The Shard of Kalak resonates, emitting a low sound and a greenish glow. Woodsman must be somewhere in Eden! Woodsman is somewhere in the Eden then. So close all this time. I am sorry that your travels have been burdensome, but since you have performed the pattern, the Shard should lead you to him and allow you to help him. Tread carefully. Only destiny herself knows what lies before you. Vahzilok can be found in the cracks and on the beaches. Since the Faultline change, you can also find them in the construction sites. Tsoo can be found on the ship in Independence Port, about 560 yards west of the tailor. Go back into Eden, and find the place where Woodsman is trapped. The Shard is now attuned to follow his current location. This is a dark matter, Task Force Name, be prepared for a great battle. You are very close, Task Force Name. Do not give in to despair. This building is slowly being torn apart by the ravages of nature. Someday soon, there will be nothing left of it. You have defeated the Devouring Earth and have pinpointed Woodsman's location. These caves remind you how much longer than man the earth has been here. You have defeated Jurassik and found a clue! The Shard of Kalak draws energy from the air around you. The entire cavern is a vortex of mystical energy for a few moments. The Shard then glows with vibrant green energy, at the same time brighter and more soothing than before. The Shard now has his essence. I vow to you this day, that I will find a way to make him corporeal again. Paragon City needs him now, more than ever. You have done a great thing today. I am glad to call you companions. Long shall the city remember the heroic battles of Task Force Name. Completing Soul of the Woodsman Task Force from Numina awards the Numina's Compatriot Badge. Numina and the spirit of the Woodsman were pleased to present you with this medal. Numina, the greatest mystical heroine of our city spoke to you of a disturbance she had sensed somewhere in Paragon City. Her protege Infernal suggested a possible location, and there you were able to free the hero Fatespinner from the Freakshow. Still sensing something amiss. Numina locked onto a confluence of energy at a Crey facility. Traveling there you discovered records indicating that Crey had been searching for a hero designated only as 'Generation Zero'. At somewhat of a mystical impasse, Numina contacted Manticore who pointed you at a Nemesis facility. There you discovered a true horror. A young hero called Scout had been captured by Nemesis a generation ago and turned into one of their Warhulks. You freed him from a living death and he implored you with his dying breath to seek the Woodsman. With a specific target in mind Numina suggested that you speak to MAGI about a locating device of some kind. That led you to recover the Shard of Kalak from the Circle of Thorns. After attuning the Shard, Numina set you upon an arduous path to try and locate Woodsman. The Shard tested your resolve greatly, but you managed to locate the area where Woodsman was abiding. Following the trial, you ended up in a huge cave network where the Devouring Earth was returning the city back to nature. Within these caverns you encountered Jurassik, a huge legendary beast. Defeating this titan enabled you to gather the essence of Woodsman into the Shard, freeing him from the Devouring Earth's. The boss, Jurassik, is in a large room with several floors, and he's surrounded by Devouring Earth. A team needs only to clear the entire room that Jurassik is in. 2009: the last mission map has changed and Jurassik is no longer in the 'wedding cake' room. He is in just an ordinary cave room. To complete the mission you need to kill Jurassik and clear the room. After that, pulling with Taunt is a good idea--the author's team pulled with a blaster snipe and he went down in seconds. Once the tanker has Jurassik's full attention, the battle is smooth sailing, as long as no defenders or blasters get to close to Jurassik's swinging car: he has a devastating cone attack. 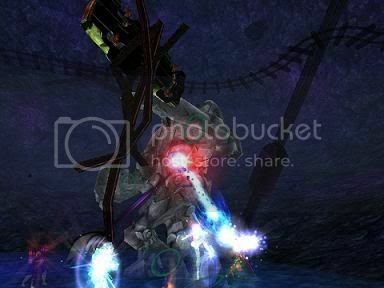 This section contains information about a major update to City of Heroes Freedom. It is provided for historical purposes. The fourth objective of the city-wide patrol used to be "Defeat 10 Hellions in Galaxy City." This part of the mission was removed in Issue 21 when Galaxy City was destroyed. The thirteenth objective of the city-wide patrol used to be "Defeat 30 Banished Pantheon in Dark Astoria." This part of the mission was removed in issue 22 when Dark Astoria was updated. This page was last modified on 5 March 2015, at 22:07.